When you think of Hackerspaces what pops to mind? For us it’s electronics first, then machining related stuff (3D printing, CNC milling), followed by welding, woodworking, auto mechanical, we could go on and on. But biology hacking doesn’t really make that list. 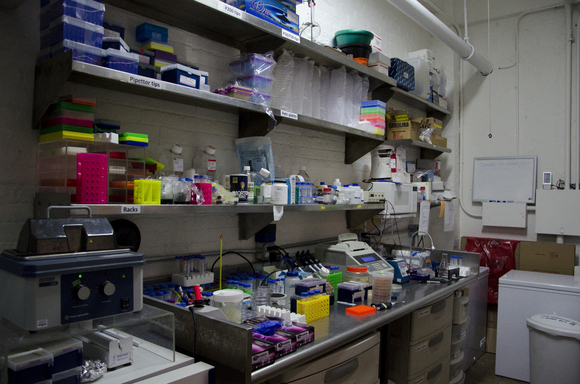 The New York based Genspace is a strong case on why we should add a biology lab as a viable hackerspace option. What are Hackerspaces other than a collection of tools and skilled members that helps to bring the mad scientists of the world out of their basements and into the light? Pretty much every Hackerspace teaches classes that are open to the public. This is basically a requirement of being a non-profit, but is also driven by the virtue of making knowledge open and available. Offering biology themed classes is an incredible tie-in for helping to see our young learners through to a career in the sciences. Vice-President and Co-Founder [Daniel Grushkin] was inspired by college students who hack organisms for a one semester long project. He wanted to try his hand at it, but needed help with the resources. He gathered a few others who were interested and, with encouragement from NYC Resistor, they got Genspace up and running in Brooklyn. The organization holds safety as a top priority. Each new member learns about the Biosafety Level 1 guidelines used by the space. For less involved experiments they even use tools of their own making, like a glovebox similar to this one. Actually, there are a number of DIYbio labs being set up right now that are planning to do BSL-2, including Biotech&Beyond (http://biotechnbeyond.com/) in San Diego, and our won Counter Culture Labs in the San Francisco East Bay (http://www.counterculturelabs.org). It just needs a little more infrastructure, and Genspace only has so much space to work with. Biosafety level 2 doesn’t necessarily mean working with known pathogens. It’s also important to be able to work safely with human cell cultures, and even for isolating unknown microbes from environmental samples. As you said – lots of fun stuff! Any idea where I could find specific information on BSL-1,2,3,4? Lets hack a root kit that exploits a 3D printer to print a virus that cures aging! Buzzwork? I read typonese, but ‘buzzwork’ sounds like what I do when I’ve had too much caffeine. Do we need to make this a new word? awwww, now that’s not fair!…..teasing me like that! Requires a membership that costs $100 a month, so instead save and get your own! err so what do you even know how much it cost to run a lab like this? there are 2 way to do this either its absolute 100% all do it yourself and you might save a little bit of money but have no chance to get an Biosafety acreditation whatsoever (also i wish you good luck getting the needed chemicals as a private citizen) or you try to have an industry standard and then 100$ a month is really nothing. from the picture i see about 7-10k worth of equipment/material lying around and then add the running cost for disposable material chemicals water and electricity 100$/month is a joke i would gladly pay this if i had access to a lab like this. Heck I have a BLS-1 lab and an ISO Class 100 clean room. They are falling behind. I am all about this but converging/adding a BIO station or area to an existing hackerspace could end up causing so problems lol. I’m not saying it wouldn’t/couldn’t work I’m just saying I forsee a ton of safety issues coming up in the event of this idea taking hold in your average hackerspace. Not really, London hackspace has had a biolab for quite some time and there has been no problems (that I know of). The average hygiene and disease status of any given person on the street is probably more of a threat to your well being than a Level 1 or even a low Level 2 lab. Many of the chemicals and materials used in electronics and materials manufacturing are far worse for your health than anything that is used in molecular biology or nucleic acid chemisty assuming you don’t eat unpolymerized acrylamide or drink large volumes of buffer. It’s generally the “ick” factor of biology that freaks people out. This is how the zombie apocalypse happens. Our hackerspace already has an SEM that no one is ever going to use for any actual science taking up an obscene amount of space. We don’t need this. Biology? That means yeast – and fermentation. Leave distillation for the advanced level. Beer is easier than whiskey. Well one of hackaday’s alumni, Caleb Kraft, just posted a slideshow on eetimes on “brew-genineering”. I can’t help but think that a bio lab would be perfect for brewing as it would be nice to have multiple varieties of yeast cultivating.